Customer Relationship Management strategies and CRM software applications are increasingly becoming cornerstone building blocks for corporations in the Asia Pacific region. Early adoption by the telecommunications and banking sectors has been quickly followed with CRM initiatives in many other sectors such as transportation, retail, government, health care and professional services. Key drivers fueling continued CRM software growth include the quests for increased customer share, market share, retention and efficiencies. Asian CEO's view their CRM spending as a strategic investment to ensure customer loyalty and retention. In a Springboard Research advisory, on-demand CRM software products represented 48 percent of the CRM software market in the Asia Pacific region. This research report, titled "SaaS CRM in Asia-Pacific: Strong Growth Despite Market Concerns" stated the web-based or on-demand CRM software market at US$183 million (Bt6.28 billion) for the year ended 2008 and estimates the market will grew to $570 million by 2012. This research advisory builds upon prior year research advisories which suggest that the Asian SaaS CRM market, excluding Japan, is estimated to grow at a compound annual rate (CAGR) of 61% over a four year period. Springboard benchmarked the Asian SaaS CRM software market at just under $70 million, and forecasts a growth to just over $460 million. The Springboard Asia-Pacific survey also determined that CRM software is a top organisational priority, with 40% of responders declaring a preference to procure on-demand CRM solutions in the next 12 months. The demand for web-based CRM systems is highest in Australia and New Zealand, with 61% of participants making purchase plans for the next 12 months, followed by India and the Southeast Asia region. According to Springboard Research analyst, Balaka Baruah Aggarwal, "As organisations seek to better manage and reduce up front IT related capital expenditure, we expect SaaS spending to become a far larger percentage of total software spending, thereby ensuring strong ongoing growth." The research report also states that on demand CRM software is now the most frequently used hosted business software application after e-mail. 29% of survey participants use web-based CRM systems in their organisations. The high majority of SAAS CRM software purchases are performed by software manufacturer direct sales representatives with online purchases being the second most popular selling channel. 25% of survey participants referenced using SAAS CRM software systems hosted by local SaaS companies. "Vendor strategy in the [Asia-Pacific] region has focused primarily on reaching out to customers directly. Existing supplier resource constraints, combined with the size and complexity of the region, excluding the Japan market, make it imperative for Software as a Service CRM vendors to use indirect channel partners who will not only be able to tap a wider customer base, but also play a significant role in ongoing customer support," commented Michael Barnes, Springboard's Vice President. According to Gartner, CRM software revenue in the Asia Pacific region grew 13 percent reaching approximately $336 million and representing a 5.2 percent share of the global CRM software market. Research firm Frost & Sullivan is a bit more optimistic and projects that CRM software investments in the Asia Pacific region will reach $408 million representing an 8 percent growth rate. They also indicate Japan will incur the majority of total CRM software investment while China and Korea will be close in tow. They also point out that CRM analytics capabilities will be a key driver for CRM software adoption in the region. While China's CRM growth rates exceeds 30 percent, almost all other Asian countries range from 4 percent to 9 percent annual growth. India, China and Malaysia are generally agreed to be the Asian markets with the greatest growth potential. India’s CRM market is dominated by call center technologies, the Malaysian market is small but steadily growing and there is no other country that invokes as much growth opportunity as China. Other more established regions such as Japan, Singapore and Australia are expected to continue to show steady and consistent growth. The three smallest regions of Indonesia, the Philippines and Thailand continue to show CRM interest but in a fluctuating pattern. The Malaysian market is small, but some analysts have cited a disproportionate growth potential due to a good infrastructure, increased liberalization, high levels of advanced education and increased investment planning. Unfortunately for business software manufacturers, Asia is not a neatly concentrated geographical location universally served as a single entity. Asia is instead more appropriately viewed as a set of markets with different cultural, economic and political environments. The Asian SMB (small and midsize business) market is the sole market not dominated by western software suppliers but instead by local and inexpensive CRM vendors. However, as CRM system adoption growth rates increase and customers demand increasingly more sophisticated solutions, there is also an increase in the percentage of western software as a service (SaaS), middle market and enterprise software products gaining market share. A high number of Western CRM solution providers have been disappointed by the poor returns from their Asian investments. A Datamonitor report cautioned CRM vendors seeking to enter the Asian software market and suggested that any entry should focus resources in achieving customer acquisitions and market share growth in the one or two geographies where the product and pricing appear to be the best fit. Analysts also suggest that local vendors will often prevail over the large Western software companies from the United States and Europe due to both software localization requirements and government interference. 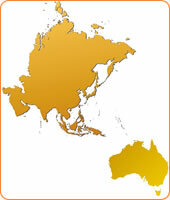 The most mature CRM markets in the Asia Pacific region include Japan, Australia, New Zealand and Hong Kong. While the Asian market is often cited as the highest growth market in the world, it is important to recognize that within Asia, the market growth rates vary dramatically by country. China represents the largest Asian market growth opportunity and projections range from 30 percent to 59 percent annual growth. Compared to China, Japan is a much more mature market and is projected to grow at approximately 6.6 percent annually. Analyst firm IDC states that the Asia Pacific business software and CRM market is known for its volatility and suggests that Singapore will show unusually high CRM adoption. According to Alan Tong, Senior Analyst of enterprise applications at IDC Asia Pacific, "The intensity of competition in some industries has led to the need for CRM as a means of obtaining a competitive edge."